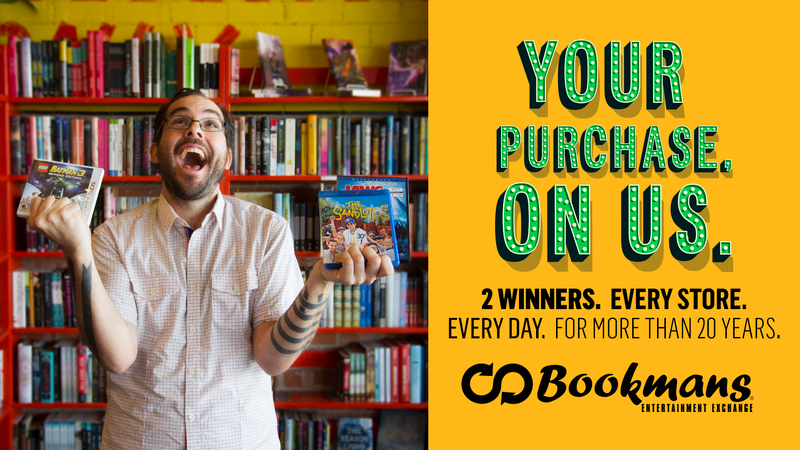 Home > News > Winners Happen Every Day at Bookmans! Bookmans’ goal is to help our customers discover new and interesting things at every visit to our stores. In one trip you can find a new favorite comic book, unearth books you’ve been meaning to read for years, grab some décor for your house, score some Blu-rays for movie night, explore generations of music, and play a few levels of a classic video game to get reacquainted with it. Ah! Browsing never sounded so incredible! What many customers have also discovered while shopping with us is that once in a while, for no reason at all, something extra-magical happens at Bookmans. A customer will get to the cashier with an armful of goodies and they’ll be rung up as usual. Then, all of a sudden, instead of getting a total, the cashier tells them that this purchase is free. Yes, FREE. Whatever they bought is on Bookmans’ tab, and they can leave with a bag full of awesome without any spending a dime. That magic moment, that pretty-much-never-seen-in-retail encounter, happens twice a day, every single day at your local Bookmans store. This means that across Arizona, 12 people will walk out of Bookmans today with a free purchase, just because. And it’s been something that Bookmans has done for more than 20 years. Why don’t we toot our own horns about it? Well, when it started, it just seemed like a really great way to reward our customers for shopping with us and supporting local businesses. Who wouldn’t want to get something for free? And at Bookmans, it’s better than just getting a free random thing with purchase. Because there’s nothing random about your buy. Customers who shop with Bookmans come to our stores ready to set out on a journey of discovery. Even if you come in looking for one thing, you never know what may catch your eye. By the time you get up to the register, your arms are holding unique, curated, and already-loved items that you’ve chosen to add to your world. And that’s what makes the sweet, sweet sound of hearing that all of those things are on us so awesome. It’s not a free lip gloss or a bookmark or something you weren’t expecting. It’s things that you already love and want to spend money on! To date, Bookmans has been honored to have given more than 87,500 customers their purchase for free. Every day we add 12 more winners to that tally. The best part of it all? You never know when it’s going to be your turn to win your purchase on us! Hi. I am a kinder first teacher and I am a huge supporter of literacy in my classroom. I have a fair amount of books for my students about a third of which I got from Bookmans. I also take them on a field trip every year to Bookmans where they learn about money and making independent choices. They have such a blast! I also encourage literacy with technology in the classroom and have donated my old laptops and tablets for them. I also had my old PSP they would use for games. It was fun and encouraged problem solving skills. I liked it because they are constantly being tested and there is little fun. But it was not enough for 29 kids and then it got too old and broke. I am looking for ways to not only replace it but get several so they can play in centers. Thank you for listening. I’ve been going to Bookman’s for over 24 years! So proud of this homegrown business in my favorite place in the world, Tucson. Thank you very much for your kind words and for being a loyal customer! We appreciate your business and are so happy to be your favorite place! Hello, Rachel! Since each Bookmans store has buyers who decide what they are interested in buying, if you are looking to sell encyclopedias I would recommend that you can contact your preferred Bookmans store speak with a buyer to gauge their interest. You can always come in and bring them to the trade counter for evaluation as well, but if they are a large/heavy collection calling may be the best option. All Bookmans store phone numbers can be found here: http://bookmans.com/stores/ and all stores are open from 9 AM until 10 PM. Thanks! Are the pictures of daily winners posted somewhere? Won when i was in the store today and wanted to know if they post the picture. Congratulations, Richard! We are collecting the photos and many of them will be featured on social media regularly. I’ve never seen or heard of this happening. How is a winner determined? Just someone your associate thinks is nice? Do the store associates pick or does the register randomly zero out a sale? Hello, Jess! Our random winners are selected by our register systems, so it truly is random! Twice a day, one of our cash registers will ring up a purchase as completely free, and our employees don’t know it is happening either until the receipt prints. And yes, it’s true, we’ve had this system in place for 20 years. Fingers crossed you are our next winner! Me and my husband love bookmans.. Always kind and always awesome to us. Even when we were down. Thank you so much for sharing your experience with us, Cece! We are so grateful for your support and the shout-out!